The Minnesota Timberwolves (also commonly known as the Wolves) are an American professional basketball team based in Minneapolis, Minnesota. The Timberwolves compete in the National Basketball Association (NBA) as a member club of the league's Western Conference Northwest Division. Founded in 1989, the team is owned by Glen Taylor who also owns the WNBA's Minnesota Lynx. The Timberwolves play their home games at Target Center, their home since 1990. Like most expansion teams, the Timberwolves struggled in their early years, but after the acquisition of Kevin Garnett in the 1995 NBA draft, the team qualified for the playoffs in eight consecutive seasons from 1997 to 2004. Despite losing in the first round in their first seven attempts, the Timberwolves won their first division championship in 2004 and advanced to the Western Conference Finals that same season. Garnett was also named the NBA Most Valuable Player for that season. The team had been in rebuilding mode for more than a decade after missing the postseason in 2005, and trading Garnett to the Boston Celtics in 2007. Garnett returned to the Timberwolves in a February 2015 trade and finished his career there, retiring in the 2016 offseason. NBA basketball returned to the Twin Cities in 1989 for the first time since the Minneapolis Lakers departed to Los Angeles in 1960. The NBA had granted one of its four new expansion teams on April 22, 1987 (the others being the Orlando Magic, Charlotte Hornets, and the Miami Heat) to original owners Harvey Ratner and Marv Wolfenson to begin play for the 1989–90 season. (There were two American Basketball Association franchises, the Minnesota Muskies, in 1967–68, and the Minnesota Pipers, in 1968–69.) The franchise conducted a "name the team" contest and eventually selected two finalists, "Timberwolves" and "Polars", in December 1986. The team then asked the 842 city councils in Minnesota to select the winner and "Timberwolves" prevailed by nearly 2–1. The team was officially named the "Minnesota Timberwolves" on January 23, 1987. Minnesota is home to the largest population of timberwolves in the lower 48 states. The Timberwolves debuted on November 3, 1989, losing to the Seattle SuperSonics on the road 106–94. Five days later, they made their home debut at the Hubert H. Humphrey Metrodome, losing to the Chicago Bulls 96–84. Two nights later on November 10, the Wolves got their first win, beating the Philadelphia 76ers at home 125–118. The Timberwolves, led by Tony Campbell with 23.2 ppg, went on to a 22–60 record, finishing in sixth place in the Midwest Division. Playing in the Hubert H. Humphrey Metrodome, the expansion Timberwolves set an NBA record by drawing over 1 million fans to their home games. This included a crowd of 49,551 on April 17, 1990, which saw the Timberwolves lose to the Denver Nuggets 99–88 in the final home game of the season. The next season, the team moved into their permanent home, the Target Center, and improved somewhat, finishing 29–53. However, they fired their head coach, Bill Musselman. They fared far worse in the 1991–92 NBA season under Musselman's successor, ex-Celtics coach Jimmy Rodgers, finishing with an NBA-worst 15–67 record. Looking to turn the corner, the Wolves hired former Detroit Pistons general manager Jack McCloskey to the same position, but even with notable first-round selections such as Christian Laettner and Isaiah Rider, the Timberwolves were unable to duplicate McCloskey's "Detroit Bad Boys" success in the Twin Cities, finishing 19–63 and 20–62 the next two seasons. One of the few highlights from that era was when the Target Center served as host of the 1994 All-Star Game where Rider won the Slam Dunk Contest with his between-the-leg "East Bay Funk Dunk". As winning basketball continued to elude the Wolves, Ratner and Wolfenson nearly sold the team to New Orleans interests in 1994 before NBA owners rejected the proposed move. Eventually, Glen Taylor bought the team and named Kevin McHale general manager. The Wolves finished 21–61 in 1994–95, and the future looked bleak. In the 1995 NBA draft, the Timberwolves selected high school standout Kevin Garnett in the first round (5th overall), and Flip Saunders was named head coach. Christian Laettner was traded along with Sean Rooks to the Atlanta Hawks for Andrew Lang and Spud Webb. Also, first-round pick Donyell Marshall was traded the previous season for Golden State Warriors' forward Tom Gugliotta. These trades paved the way for rookie Kevin Garnett to become the go-to player inside. Garnett went on to average 10.4 ppg in his rookie season as the Wolves finished in 5th place in the Midwest Division, with a 26–56 record. In 1996, the Wolves added another star player in the draft, trading Ray Allen to the Milwaukee Bucks for the rights to Stephon Marbury, the 4th overall pick. The addition of Marbury had a positive effect on the entire team, as Garnett and Gugliotta became the first Wolves to be selected to the All-Star team. Gugliotta and Garnett led the Timberwolves in scoring as the team made the playoffs for the first time in franchise history with a record of 40–42. However, in the playoffs the Timberwolves made a quick exit as they were swept by the Houston Rockets in three straight games. The T-Wolves also decided to change their image by changing their team logo and color scheme, adding black to the team colors and replacing the original logo with one featuring a snarling wolf looming over a field of trees. It was also during this season that Minnesota began to play on a parquet floor. In 1997, Garnett and Marbury established themselves as two of the brightest rising stars in the NBA. Garnett averaged 18.5 ppg and 9.6 rebounds per game, while Marbury averaged 17.7 ppg and dished out 8.6 assists per game. Despite losing leading scorer Tom Gugliotta for half the season, the Timberwolves went on to post their first winning season at 45–37, making the playoffs for the second straight season. After dropping Game 1 of the playoffs on the road to the Seattle SuperSonics, the Timberwolves won their first postseason game in Game 2, winning in Seattle 98–93. As the series shifted to Minnesota, the Timberwolves had an opportunity to pull off the upset as they won Game 3 by a score of 98–90. However, the Wolves dropped Game 4 at home as the Sonics went on to win the series in five games. In 1998, a year after signing Kevin Garnett to a six-year, $126 million contract, the Timberwolves were then used as the poster child of irresponsible spending as the NBA endured a four-month lockout that wiped out much of the season. With an already cap-heavy payroll, the Wolves let Tom Gugliotta walk, partially because the team wanted to save money in order to sign Stephon Marbury to a long-term contract, and in part because Gugliotta did not want to play with the young player. This move proved unsuccessful, however, as Stephon Marbury wanted to be the biggest star on a team and subsequently forced an in-season trade by refusing a contract extension. In the three-team mid-season deal that sent Marbury to the New Jersey Nets, the Wolves got Terrell Brandon in return and a first-round draft pick in the 1999 draft (which turned out to be the sixth pick). The Wolves made the playoffs for the third straight season by finishing in fourth place with a 25–25 record. In the playoffs, the Timberwolves were beaten by the eventual champion San Antonio Spurs in four games. In 1999, the Timberwolves drafted Wally Szczerbiak with the sixth pick in the draft. He had a solid season, finishing third on the team in scoring with 11.6 points per game. Led by Kevin Garnett, who averaged 22.9 points per game and 11.8 rebounds per game, the Timberwolves had their first 50-win season and finished in 3rd place with a record of 50–32. However, in the playoffs the Wolves again fell in the first round, losing to the Portland Trail Blazers in four games. The Wolves opened the 1999–2000 regular season with two home games against the Sacramento Kings at the Tokyo Dome on November 6 and 7. In the summer of 2000, guard Malik Sealy was killed in a car accident by drunk driver Souksangouane Phengsene, who was driving the wrong way down the freeway. Sealy's number has since been retired: the number 2 jersey memorialized with Sealy's name on a banner hanging from the rafters of Target Center. The drunk driver was convicted of vehicular homicide and sentenced to four years in prison. He was previously arrested for drunk driving in Iowa in 1997 and has since been arrested twice more for driving while intoxicated, in 2006 and 2008. Also in that season, a free agent deal signed by Joe Smith was voided by the NBA, who ruled that the Timberwolves violated proper procedure in signing the contract. The league stripped the Timberwolves of five draft picks (first round 2001–05), but it was eventually reduced to three first-round picks (2001, 2002, and 2004). The league also fined the Timberwolves $3.5 million and suspended general manager Kevin McHale for one year. Smith eventually signed with the Detroit Pistons before re-signing with the Timberwolves in 2001. Despite those setbacks, the Timberwolves made the playoffs for the fifth straight season with a 47–35 record. In the playoffs, the Timberwolves were eliminated in the first round again by the San Antonio Spurs in four games in the spring of 2001. A number of newcomers arrived prior to the start of the next season, including Gary Trent, Loren Woods and Maurice Evans and the return of Joe Smith. The Timberwolves started the season by winning their first six games and went on to achieve a franchise-best start of 30–10. The Timberwolves had a franchise record 53-point win over Chicago in November. They finished with a 50–32 record: their second ever 50-win season that was highlighted by another All-Star appearance by Garnett and a breakout season by Wally Szczerbiak, who earned his first All-Star appearance. Once again, Minnesota lost in the first round of the playoffs, where they were swept by the Dallas Mavericks in three straight games. The 2002–03 season seemed to look up for the Timberwolves. Garnett had a great season where he finished second in MVP voting with 23.0 points per game and 13.4 rebounds per game and the Timberwolves finished in third place with a 51–31 record. As a result, they were awarded home court advantage for the first time when facing the three-time defending champion Los Angeles Lakers. After being blown out at home in Game 1, the Timberwolves had a chance to take a 3–1 series lead heading into the 4th quarter of Game 4 in Los Angeles, but the Lakers came back to win the game and eventually won the series in six games. In the end, the Timberwolves were eliminated in the first round of the playoffs for the seventh straight year. In 2003, the Timberwolves made two strong off-season moves, trading away forward Joe Smith and injured guard Terrell Brandon in a multi-player deal for Ervin Johnson, Sam Cassell and embattled guard Latrell Sprewell. During the 2003–04 NBA season, the Timberwolves became the team to beat in the Western Conference. They finished the season as the top seed in the Western Conference with a record of 58–24, and beat the Denver Nuggets and Sacramento Kings in the first two rounds of the NBA playoffs. Kevin Garnett leapt upon the scorer's table upon the completion of Game 7 in the Sacramento series, one of the more defining moments in franchise playoff history. The Timberwolves' run ended in the Western Conference finals as the team lost to the Lakers, the previous Minnesota franchise. Due to an injured hip, Sam Cassell played only sparingly during the series with the Lakers. Garnett earned his first MVP award with 24.2 points, 13.9 rebounds and 5.0 assists per game. In the 2004–05 season, the Wolves roster remained the same team from the previous season. The team was plagued with contract disputes and the complaining of key players Latrell Sprewell, Sam Cassell, and Troy Hudson. Coach Flip Saunders was replaced in mid-season by GM Kevin McHale, who took over the team for the rest of the season. The Timberwolves finished 44–38, and missed the playoffs for the first time in eight years, by one game, to the Memphis Grizzlies. During the 2005 offseason, McHale and the Wolves started their search for a head coach. McHale interviewed Seattle SuperSonics assistant coach Dwane Casey, San Antonio Spurs assistant P. J. Carlesimo, former coach John Lucas and Wolves assistants Randy Wittman, Sidney Lowe and Jerry Sichting, among others. On June 17, 2005, the Timberwolves hired Casey as the new head coach. It was Casey's first head coaching job, making him the Wolves' seventh head coach in their 16-year history. In the 2005 draft, the Timberwolves selected Rashad McCants, a shooting guard from North Carolina with the 14th overall pick of the first round. The Timberwolves also selected Bracey Wright, a guard from Indiana, with the 17th pick of the second round (47th overall). During the offseason, they traded All-Star Sam Cassell and a protected future first-round draft pick to the Los Angeles Clippers for Marko Jarić and Lionel Chalmers. They also signed free agent Nikoloz Tskitishvili. On January 26, 2006, the Wolves traded forward Wally Szczerbiak, centers Dwayne Jones and Michael Olowokandi, and a future first-round draft pick to the Boston Celtics. In return, they received forward-guard Ricky Davis, center Mark Blount, forward Justin Reed, guard Marcus Banks, and two second-round draft picks. 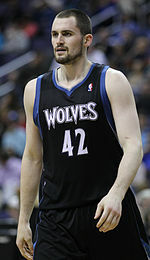 In a separate trade on the same day, the Timberwolves traded Tskitishvili to the Phoenix Suns for a 2006 second-round draft pick. The Timberwolves finished 33–49, missing the playoffs for the second consecutive year. In the 2006 NBA draft, the Timberwolves selected future NBA Rookie of the Year Brandon Roy with the 6th overall pick, Craig Smith with the 36th pick, forward Bobby Jones with the 37th pick and center Loukas Mavrokefalidis with the 57th pick. The Timberwolves traded Roy to the Portland Trail Blazers for Randy Foye and cash considerations. The Timberwolves then traded Bobby Jones to the Philadelphia 76ers for a 2007 second-round pick and cash. On January 23, McHale fired head coach Casey and replaced him with Randy Wittman. McHale explained in a news conference that it was inconsistency by Casey that led to the firing. Casey had compiled an overall record of 53–69. They finished the 2006–07 season with a record of 32–50, allowing them to keep their 2007 first-round pick. On July 31, 2007, the Minnesota Timberwolves reached a deal to trade All-Star Kevin Garnett to the Boston Celtics for Al Jefferson, Theo Ratliff, Gerald Green, Sebastian Telfair, Ryan Gomes, two first-round draft picks, and cash considerations. This is the largest combination of players and picks ever traded for a single player in NBA history. Garnett and the Celtics went on to win the 2008 NBA Finals in six games over the Los Angeles Lakers. That summer, the Timberwolves traded Mike James and Justin Reed to the Houston Rockets for Juwan Howard. In October of the same year, the Timberwolves waived Howard after reaching a contractual buyout agreement, worth $10 million of roughly $14.25 million which Minnesota would have owed him. The team also traded Ricky Davis and Mark Blount to the Miami Heat in exchange for the Heat's Antoine Walker, Michael Doleac, Wayne Simien, and a 2008 protected first-round draft pick. In the 2007 NBA draft the Timberwolves selected Corey Brewer, with the 7th pick, and Chris Richard with the 41st overall pick, both being from the two-time NCAA national champion Florida Gators. 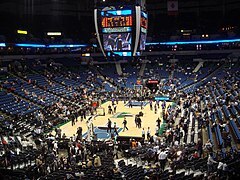 Minnesota began the NBA preseason with two games in London and Istanbul, as part of NBA Europe Live 2007. On October 10, The Wolves lost to Garnett and the revamped Celtics, 92–81. To start the season, the Wolves began 0–5 before ending the drought with a home win over Sacramento. That drought also brought about speculation of the possible dismissal of coach Wittman. The youngest team in the NBA began adjusting to life after trading franchise star Garnett to Boston, meanwhile playing without budding talent Randy Foye for the first half of the season. Guards Sebastian Telfair and Marko Jarić were deputized as starting point guards during Foye's injury absence. The Timberwolves finished the season 22–60. On a handful of occasions during the season, the team showed flashes of its potential in wins or very close contests with top-tier teams. In the 2008 NBA draft, the Timberwolves selected O. J. Mayo of USC with the third overall pick. When the draft concluded, the Timberwolves traded Mayo, Antoine Walker, Greg Buckner, and Marko Jarić to the Memphis Grizzlies in exchange for fifth overall pick Kevin Love, Mike Miller, Jason Collins, and Brian Cardinal in a move that Jim Stack called, "a deal we couldn’t pass up." In 2008, in celebration of the franchise's 20th anniversary, the team unveiled an updated version of its logo and uniforms. The new designs first appeared in the first preseason game against the Chicago Bulls at United Center on October 14, 2008. They also refurbished the floor at Target Center, returning to the traditional floor pattern and added touches of varnish while exposing most of the hardwood. On December 8, 2008, after a 23-point loss to the Los Angeles Clippers that dropped the team to 4–15, the Timberwolves fired head coach Wittman and McHale took over. McHale also relinquished his vice president of basketball operations duties. It was unclear whether McHale's future with the team was dependent on the success or progress of the team which he had put together over the previous four years. Those questions seemed to be answered when the Timberwolves went 10–4 for the month of January, giving McHale the coach of the month honors. But on February 8, 2009, the team's main star Al Jefferson tore his ACL in his right knee in a game at New Orleans, sidelining him for the rest of the season. At the time of the injury, Jefferson was having his best season to date, averaging 23 points, 11 rebounds and 2 blocks. Without Jefferson and Corey Brewer (who also suffered a season-ending injury), the Wolves sputtered, to finish with a 24–58 record. On June 17, 2009, new president of basketball operations David Kahn announced that McHale would not be returning to the team as head coach. Kahn did not give a specific reason for McHale's dismissal, only saying "this is going to be a transition period." For his part, McHale said he wanted to come back but was not offered a contract. Later, in August, the Timberwolves announced the signing of Kurt Rambis, then an assistant for the Los Angeles Lakers, to a four-year, $8 million contract to be their new head coach. In Rambis's first season, the team stumbled to the second-worst record in the league, as their 15–67 record was only surpassed by that of the New Jersey Nets, who finished at 12–70. On July 12, 2010, Minnesota traded for Miami Heat forward Michael Beasley, the second pick from the 2008 NBA draft. In a locally untelevised game on November 12, 2010, Kevin Love grabbed a franchise-record 31 rebounds and scored 31 points in a win over the New York Knicks, the NBA's first 30–30 game in 28 years. Love was later named an All Star for the 2010–11 NBA season, the franchise's first All Star selection since Kevin Garnett in 2007. Love would later break Garnett's team record of 37 straight double-doubles on February 8, 2011 in a win over the Houston Rockets. On March 8, 2011, Love acquired his 52nd straight double-double, surpassing the mark of Moses Malone for the most consecutive double-doubles since the NBA-ABA merger in a win over the Indiana Pacers. The streak eventually reached 53 games and came to an end with a six-point, 12-rebound performance in a 100–77 loss to the Golden State Warriors on March 13. In October 2011, Love was ranked 16th among active players by ESPN. On February 21, 2011, Corey Brewer and Kosta Koufos were traded to the New York Knicks and Denver Nuggets respectively for Knicks Anthony Randolph and Eddy Curry (plus $3 million in cash from New York and a 2015 second-round draft pick from Denver) as part of a larger trade that sent all-star Carmelo Anthony from Denver to New York. On the downside, with a 121–102 loss to the Houston Rockets, the Timberwolves fell to 17–65, finishing last in the Western Conference for the second straight year. They also clinched the 2010–11 NBA season's worst record. During the offseason, the Timberwolves were finally able to bring 2009 fifth overall pick Ricky Rubio over from Spain. In the 2011 NBA draft, with the second overall pick, the Timberwolves selected Derrick Williams of Arizona. The Timberwolves then traded guard Jonny Flynn and the draft rights to Donatas Motiejūnas (No. 20) to the Houston Rockets for center Brad Miller, the draft rights to Nikola Mirotić (No. 23), Chandler Parsons (No. 38) and a future first-round pick. The Timberwolves traded Mirotic's rights to the Chicago Bulls for the rights to Norris Cole (No. 28) and Malcolm Lee (No. 43). The Timberwolves then sold the rights to Parsons back to the Rockets. The Timberwolves traded Norris Cole (No. 28) to the Miami Heat for the draft rights to Bojan Bogdanovic (No. 31), a future second-round pick and cash considerations. The Timberwolves then traded Bogdanovic's rights to the New Jersey Nets for a future second-rounder and cash. The Trail Blazers traded the draft rights to Tanguy Ngombo (No. 57) to the Timberwolves. On July 12, 2011, Kurt Rambis was fired as coach of the team after compiling a 32–132 record in two seasons with the team. On September 13, 2011, the team announced that they had hired Rick Adelman to be the team's new head coach. The Timberwolves began the 2011–12 NBA season with a 17–17 record before the All-Star break. On March 9, 2012, Rubio tore his left ACL and LCL in a collision with Kobe Bryant. The injury ended his season and severely hurt the Timberwolves' chances of making the playoffs. Despite being in contention at mid-season, the team ultimately failed to reach the postseason for the eighth straight year due to injuries to a number of key players. The team finished with a record of 26–40, with the only win of the team's final 14 games coming against the Detroit Pistons. The team traded the 18th overall pick of the 2012 NBA draft to the Houston Rockets for Chase Budinger. On June 26, 2012, the Timberwolves selected Robbie Hummel with the 58th overall pick, the team's only selection during the draft. During the offseason, the team signed former Timberwolves draft pick Brandon Roy to a two-year, $10 million contract. The deal was announced on July 31. With the inclusion of Roy in the shooting guard position, players that also signed during the offseason included Andrei Kirilenko, Alexey Shved and Louis Amundson. While technically in playoff contention early, multiple injuries began to plague the team. Roy, Budinger, Lee and free agent signing Josh Howard succumbed to knee injuries. The mood of despair was shortly lifted by the splashy return of Rubio. But not long after, Love, who missed the first nine games of the season after fracturing the third and fourth metacarpals in his right hand in a preseason home workout, suffered a recurrence of the injury in a win over the Denver Nuggets on January 3. One of the few highlights in the second half of the season was Rubio's triple-double performance during a surprising win over the then-first place San Antonio Spurs, albeit without Spurs stars Tony Parker and Tim Duncan playing due to injury. On April 6, in a game against the Detroit Pistons, Adelman won his 1000th game as a head coach. This season marked the first time the franchise had won at least 30 games without Kevin Garnett on the roster. The team decided to part ways with David Kahn after the season ended, with Flip Saunders being brought in to replace him. In the 2013 NBA draft, the team traded the 9th overall pick Trey Burke for Shabazz Muhammad (14th pick) and Gorgui Dieng (21st pick) in the first round from the Utah Jazz. On March 28, 2014, the Timberwolves set a franchise record for points in a regular season game with a 143–107 win over the Los Angeles Lakers. The win also marked the Timberwolves' first season-series win over the Lakers since the 2005–06 season. The team accumulated 40 wins for the first time since the 2005 season, but missed the playoffs for the tenth consecutive year. On April 21, 2014, Rick Adelman announced his retirement from coaching in the NBA. Adelman acquired a 97–133 record in three seasons with the team. On August 23, 2014, the Timberwolves, Cleveland Cavaliers, and Philadelphia 76ers agreed on a three-way trade that would send Kevin Love to the Cavaliers to join LeBron James and Kyrie Irving. Minnesota received Andrew Wiggins, Anthony Bennett, Thaddeus Young, and a trade exception as part of the deal. The 76ers received Alexey Shved, Luc Mbah a Moute, and a 2015 first-round pick via the Miami Heat. The 2014–15 season marked a new era for the Timberwolves, beginning with the Kevin Love trade. Flip Saunders was promoted to head coach, making it his second stint with the Timberwolves after coaching the team from 1995 to 2005. The Timberwolves started the new season with a 105–101 loss to the Memphis Grizzlies, with Wiggins making his debut. The team recorded its first win the following game, a 97–91 victory over the Detroit Pistons. On November 12, 2014, the Timberwolves played an international home game at Mexico City Arena against the Houston Rockets. The Timberwolves had a 16–66 record for the season and missed the playoffs for the 11th consecutive year. Despite this, Wiggins was selected as the NBA Rookie of the Year, the first player in franchise history to be so honored. Draft pick Zach LaVine gained league notoriety after winning the Slam Dunk Contest. LaVine and Wiggins, dubbed "The Bounce Brothers", were seen as being the future of the franchise. Due to having the worst record in the NBA for the 2014–15 season, the Timberwolves had the highest chance, at 25%, to receive the first pick in the 2015 NBA draft at the 2015 NBA draft lottery. On May 19, the Timberwolves received the first overall pick in the 2015 NBA draft for the first time in franchise history. On June 25, the Timberwolves selected Karl-Anthony Towns as the number one pick and acquired Tyus Jones through a trade with the Cleveland Cavaliers. The 2015 season also saw the return of Kevin Garnett. In February, Garnett, at the time with the Brooklyn Nets, waived his no-trade clause to enable a trade back to Minnesota which sent Thaddeus Young to Brooklyn. In his first game back, Garnett resumed wearing the No. 21 jersey that had not been worn by any other Timberwolves player since his departure and the team defeated the Washington Wizards 97–77 at the Target Center. On June 6, 2014, Saunders was named the head coach of the Minnesota Timberwolves, returning to the franchise for a second stint. During his second stint with the Timberwolves, Saunders was diagnosed with Hodgkin's lymphoma. As a result, during his recovery, he would delegate his coaching position over to assistant coach and former NBA Coach of the Year winner Sam Mitchell. On October 25, 2015, Saunders died at age 60. Mitchell took over as head coach. In honor of Saunders, the team announced that they would wear a patch reading "FLIP" on their uniforms for the duration of the 2015–16 season. On April 20, 2016, the Timberwolves agreed to sign Tom Thibodeau to be their head coach and president of basketball operations. He was previously an assistant coach for the team from 1989 to 1991. On September 23, 2016, Kevin Garnett announced his retirement after 21 seasons in the NBA. He expressed interest in playing one more year for the Timberwolves but felt that his knees would be unable to hold up for the duration of the season. The Timberwolves ended their season with a 31–51 record, having only a two-game improvement from their previous season. On June 22, 2017, the Timberwolves acquired Jimmy Butler and the 16th overall pick in the 2017 draft in trade for Zach Lavine, Kris Dunn and the 7th overall pick in the draft (used to select Lauri Markkanen). Later that night, the Timberwolves selected center Justin Patton with the 16th overall pick in the draft. Later, the team added Taj Gibson, Jeff Teague, Jamal Crawford and Derrick Rose during free agency. The Timberwolves ended their season with a 47–35 record, which became the first winning season since the 2004–05 season, and secured the last spot in the playoffs on the final day of the regular season with a 112–106 win over the Denver Nuggets. The 2017–18 season also ended the longest streak without a playoff appearance at 13 seasons. The Timberwolves would be eliminated in the first round of the playoffs by the Houston Rockets in five games. On November 12, 2018, the Timberwolves traded Butler and Justin Patton to the Philadelphia 76ers in exchange for Robert Covington, Dario Šarić, Jerryd Bayless and a 2022 second-round draft pick. On January 6, 2019, it was announced that Coach Thibodeau was fired as head coach and president of basketball operations. After Coach Thibodeau was fired, it was announced that Ryan Saunders would serve as interim head coach until a permanent head coach is found. The Minnesota Timberwolves' wordmark logo used from 2009 to 2017. In their inaugural season in 1989, the Timberwolves (or "Wolves" as it said on their jerseys) debuted blue road uniforms with green lettering and numbers with white. Their home uniforms featured blue lettering and numbers with green outlining. The creation of both uniforms was led by head designer, Brian Mulligan. There was going to be a green alternate jersey with blue lettering to go with the uniforms, but the idea was dropped. It would've followed a similar move the Dallas Mavericks took when they switched back to blue in the early 1990s, opting the Wolves a chance to use green for a jersey color instead. After drafting Kevin Garnett, the Timberwolves design team, under guidance from Brian Mulligan, changed their uniforms yet again in 1996. This time, the team added black and grey to the mix, and changing to a darker shade of blue. The front of the jerseys then said the team's full name "Timberwolves" in a different font. For the 1997–98 season, a black alternate uniform was introduced. Those uniforms were used until the 2007–08 season. The Timberwolves unveiled a new alternate logo on June 25, 2008. The uniforms changed again in the 2008 off-season, this time with the road jerseys reading "Minnesota" and the home jerseys reading "Wolves", similar to that of the team's early years. Both uniforms had green, black, grey and blue on the pits and sides of the shorts. The Timberwolves unveiled modified uniforms on August 16, 2010. The new uniforms eliminated the green from the collar, jersey and shorts, and the team also adjusted its number font again. On November 23, 2010, the Timberwolves unveiled a black alternate uniform. On November 27, 2013, the team changed their black road alternate jersey to a short sleeved jersey. The change came about due to the NBA's introduction of sleeved jerseys. On April 11, 2017, the team unveiled a new logo to coincide with the massive roster turnaround of the past few years. The Timberwolves revealed four new uniforms for the 2017-18 season as a part of a Nike-sponsored, league-wide initiative to redesign team uniforms. All four uniforms used "Wolves" for the team name and included the Nike Swoosh and Fitbit logos. The Association Edition uniform, revealed on August 10, 2017, consisted of a white uniform with navy and blue stripes and lettering. The Icon Edition uniform, which was revealed alongside its Association counterpart, has a navy body with white stripes and lettering. On September 15, the Timberwolves revealed their Statement Edition uniform which is primarily neon green with navy stripes, navy lettering for the team and player names, and white text with a navy stroke for the jersey numbers. The City Edition uniform, which is primarily gray with white lettering, was the last to be revealed on December 27. On August 30, 2018, the Timberwolves unveiled their first "Classic" edition uniforms based on the black alternates used from 1997 to 2008. They also unveiled a dark purple "City" uniform inspired by Prince's 1984 album Purple Rain, as well as a white "Earned" version that was exclusive only to the 16 teams that made the 2018 playoffs. Crunch the Wolf is the official mascot of the Minnesota Timberwolves. 1 The Timberwolves retired Malik Sealy's number after he was killed by a drunk driver in an automobile accident after the 1999–2000 season concluded. The accident happened on Kevin Garnett's 24th birthday. 2 The Timberwolves retired "FLIP" in honor of Flip Saunders on February 15, 2018, who died after a battle with Hodgkin's lymphoma on October 25, 2015. The Timberwolves hold the draft rights to the following unsigned draft picks who have been playing outside the NBA. A drafted player, either an international draftee or a college draftee who is not signed by the team that drafted him, is allowed to sign with any non-NBA teams. In this case, the team retains the player's draft rights in the NBA until one year after the player's contract with the non-NBA team ends. This list includes draft rights that were acquired from trades with other teams. The flagship station for the Timberwolves Radio Network is 830 WCCO (AM). WCCO became the team's radio home in 2011. Before that, KFAN/KFXN had been the Timberwolves' Twin Cities flagship station since the team's inception, except for a brief two-year hiatus to KLCI BOB 106.1 FM for the 2006–07 and 2007–08 seasons. Alan Horton has been the team's radio play-by-play announcer since the 2007–08 season. The Timberwolves' games are broadcast on Fox Sports North. The broadcasters are Dave Benz and Jim Petersen. ^ "The Record Book". Timberwolves.com. NBA Media Ventures, LLC. Retrieved January 29, 2017. ^ "NBA.com/Stats–Minnesota Timberwolves seasons". National Basketball Association. Retrieved January 29, 2017. ^ a b "A New Era of Timberwolves Basketball". Timberwolves.com. NBA Media Ventures, LLC. April 11, 2017. Retrieved April 12, 2017. ^ a b Timberwolves PR (April 11, 2017). "TIMBERWOLVES NEW LOGO FOR 2017-18 SEASON UNVEILED". Timberwolves.com. NBA Media Ventures, LLC. Retrieved April 20, 2017. The colors include midnight blue, aurora green, lake blue, moonlight grey, and frost white. ^ "Minnesota Timberwolves Reproduction and Usage Guideline Sheet". NBA Properties, Inc. Retrieved August 10, 2016. ^ Timberwolves PR (June 20, 2017). "Minnesota Timberwolves and Fitbit Announce Multi-Year Partnership Naming Company "Official Wearable," "Official Sleep Tracker" and Jersey Patch Sponsor". Timberwolves.com (Press release). NBA Media Ventures, LLC. Retrieved December 17, 2017. ^ "Minnesota Timberwolves Franchise Index". Basketball-Reference.com. Retrieved March 22, 2013. ^ "Glen Taylor". Forbes. April 18, 2012. Retrieved March 22, 2013. ^ "Minnesota Timberwolves". Target Center. Retrieved March 22, 2013. ^ "Kevin Garnett Bio Page". NBA.com. Archived from the original on July 25, 2008. Retrieved March 22, 2013. ^ "Five players, two picks sent to Wolves for Garnett – NBA – ESPN". Sports.espn.go.com. August 1, 2007. Retrieved March 22, 2013. ^ "TIMBERWOLVES: Suggested Nicknames for the Minnesota NBA Franchise". National Basketball Association. February 1, 2004. Archived from the original on February 3, 2004. Retrieved August 3, 2015. ^ "Behind the Name: Timberwolves". National Basketball Association. August 3, 2015. Retrieved August 3, 2015. ^ "2014-15 Minnesota Timberwolves Media Guide" (PDF). Minnesota Timberwolves. October 23, 2014. Retrieved August 3, 2015. ^ "Wolf Management: Minnesota DNR". Minnesota Department of Natural Resources. August 3, 2015. Retrieved August 3, 2015. ^ "1989-90 Minnesota Timberwolves Roster and Stats". Basketball-Reference.com. Retrieved March 22, 2013. ^ "1994 NBA Slam Dunk Competition". YouTube. Retrieved March 22, 2013. ^ a b "1994-95 Minnesota Timberwolves Roster and Stats". Basketball-Reference.com. Retrieved March 22, 2013. ^ "1995 NBA Draft". Basketball-Reference.com. June 28, 1995. Retrieved March 22, 2013. ^ "1996-97 Minnesota Timberwolves Roster and Stats". Basketball-Reference.com. Retrieved March 22, 2013. ^ "1997-98 Minnesota Timberwolves Roster and Stats". Basketball-Reference.com. Retrieved March 22, 2013. ^ "1998-99 Minnesota Timberwolves Roster and Stats". Basketball-Reference.com. Retrieved March 22, 2013. ^ "1999 NBA Draft". NBADraft.net. Retrieved March 22, 2013. ^ "2000 NBA Playoffs Summary". Basketball-Reference.com. Retrieved March 22, 2013. ^ "Driver convicted in Malik Sealy death arrested again for DWI". USA Today. March 30, 2008. Retrieved May 12, 2010. ^ "2000-01 Minnesota Timberwolves Roster and Stats". Basketball-Reference.com. Retrieved March 22, 2013. ^ "CNNSI.com - 2001 NBA Playoffs". Sports Illustrated. Retrieved March 22, 2013. ^ "2002 NBA Playoffs Summary". Basketball-Reference.com. Archived from the original on September 22, 2013. Retrieved March 22, 2013. ^ "PLAYOFFS 2003". NBA.com. Retrieved March 22, 2013. ^ "2003-04 Minnesota Timberwolves Roster and Stats". Basketball-Reference.com. Retrieved March 22, 2013. ^ "Dwane Casey NBA & ABA Basketball Coaching Record". Basketball-Reference.com. April 17, 1957. Retrieved March 22, 2013. ^ "NBA Draft Board". NBA.com. Retrieved March 22, 2013. ^ "2005 NBA Draft". NBADraft.net. Retrieved March 22, 2013. ^ "Nikoloz Tskitishvili NBA & ABA Stats". Basketball-Reference.com. Retrieved March 22, 2013. ^ "NBA.com". NBA.com. September 16, 2008. Retrieved March 22, 2013. ^ "2006-07 Minnesota Timberwolves Roster and Stats". Basketball-Reference.com. Retrieved March 22, 2013. ^ "Celtics obtain former MVP in 7-for-1 deal". www.espn.com. Associated Press. Retrieved December 10, 2017. ^ Thomsen, Ian (October 29, 2007). "How the Celtics landed Kevin Garnett and became relevant again". Sports Illustrated. Retrieved June 18, 2018. ^ Marc Stein (June 14, 2007). "Rockets, Wolves finalize swap of Howard, James". ESPN. Retrieved June 15, 2007. ^ "Draft 2007". NBA.com. Retrieved March 22, 2013. ^ "2016-17 NBA Regular Season Conference Standings - National Basketball Association". ESPN.com. ^ "2008 NBA draft trades overview - NBA - ESPN". Sports.espn.go.com. June 27, 2008. Retrieved March 22, 2013. ^ "Timberwolves Logo Undergoes Facelift". Minnesota Timberwolves. June 25, 2008. Retrieved June 26, 2008. ^ "Al Jefferson 2007-08 Game Log". Basketball-Reference.com. Retrieved March 22, 2013. ^ "2007-08 Minnesota Timberwolves Roster and Stats". Basketball-Reference.com. Retrieved March 22, 2013. ^ "2009-10 New Jersey Nets Roster and Stats". Basketball-Reference.com. Retrieved March 22, 2013. ^ "Sources: Heat clear space, deal Beasley". ESPN. July 9, 2010. Retrieved July 9, 2010. ^ "Kevin Love posts NBA's 1st 30–30 game in 28 years as Knicks fade in 4th". ESPN. Associated Press. November 12, 2010. ^ "ESPN: Kevin Love is the 16th best player in NBA". Canis Hoopus. Retrieved March 22, 2013. ^ "Wolves say hello, say goodbye". StarTribune.com. Retrieved March 22, 2013. ^ "Targuy Ngombo – Qatar's NBA Hopeful???". Asia Basketball Update. June 21, 2011. Archived from the original on March 7, 2013. Retrieved March 22, 2013. ^ "Most Popular E-mail Newsletter". USA Today. September 13, 2011. ^ Arnovitz, Kevin (February 6, 2013). "The book on Rick Adelman". ESPN. Retrieved December 13, 2016. ^ "Ridnour's Buzzer Beater Sends Wolves Past Jazz, 100-98 | THE OFFICIAL SITE OF THE MINNESOTA TIMBERWOLVES". National Basketball Association. February 22, 2012. Retrieved March 22, 2013. ^ "Concussion holds Love out against Clippers". Foxsportsnorth.com. April 12, 2012. Retrieved March 22, 2013. ^ "Timberwolves' Ricky Rubio faces 'long process' in injury recovery". St. Paul Pioneer Press. April 9, 2012. Retrieved June 30, 2016. ^ "Wolves officially eliminated from postseason". Foxsportsnorth.com. April 12, 2012. Retrieved March 22, 2013. ^ "T-Wolves trade pick to Rockets for Budinger". Foxsportsnorth.com. Retrieved March 22, 2013. ^ "Minnesota Timberwolves send 18th pick to Houston Rockets for Chase Budinger, rights to Lior Eliyahu – ESPN". Espn.go.com. June 26, 2012. Retrieved March 22, 2013. ^ "Report: Wolves trade No. 18 pick to Houston for Chase Budinger | 1500 ESPN Twin Cities – Minnesota Sports News & Opinion (Twins, Vikings, Wolves, Wild, Gophers) | Sportswire: Minnesota Timberwolves". 1500espn.com. June 26, 2012. Archived from the original on September 13, 2012. Retrieved March 22, 2013. ^ "AP Source: Timberwolves Trade 18th Pick For Budinger « CBS Minnesota". Minnesota.cbslocal.com. June 26, 2012. Retrieved March 22, 2013. ^ "Robbie Hummel 2012 NBA Draft Profile - ESPN". Insider.espn.go.com. March 8, 1989. Retrieved March 22, 2013. ^ Freeman, Eric (May 30, 2012). "Brandon Roy expects to start, play at a high level | Ball Don't Lie – Yahoo! Sports". Sports.yahoo.com. Retrieved March 22, 2013. ^ "Wolves Sign 3-Time NBA All-Star Brandon Roy | THE OFFICIAL SITE OF THE MINNESOTA TIMBERWOLVES". Nba.com. Retrieved March 22, 2013. ^ "Ricky Rubio's return sparks Timberwolves past Mavericks". USAToday.com. December 16, 2012. Retrieved April 17, 2013. ^ "Kevin Love: Minnesota Timberwolves star to miss 8-10 weeks with injury | The Point Forward – SI.com". Nba.si.com. January 9, 2013. Retrieved March 22, 2013. ^ Target Center, Minneapolis (March 12, 2013). "San Antonio Spurs vs. Minnesota Timberwolves - Recap - March 12, 2013 - ESPN". Scores.espn.go.com. Retrieved March 22, 2013. ^ "Pistons vs. Timberwolves - Game Recap - April 6, 2013 - ESPN". ESPN.com. ^ "Suns vs. Timberwolves - Game Recap - April 13, 2013 - ESPN". ESPN.com. ^ "Flip Saunders returning to Timberwolves". USA Today. May 3, 2013. Retrieved December 13, 2016. ^ Ervin, Phil (June 27, 2013). "Wolves land Muhammad, Dieng in deal with Jazz". Fox Sports North. Retrieved December 13, 2016. ^ Kapsner, Peter (March 29, 2014). "Notebook: Wolves 143, Lakers 107". National Basketball Association. Retrieved December 13, 2016. ^ Reusse, Patrick (April 17, 2014). "Reusse: Wolves' season shriveled into list of unmet goals". Star Tribune. Retrieved December 13, 2016. ^ "Rick Adelman to announce retirement". ABC News. April 21, 2014. Retrieved December 13, 2016. ^ Mayo, David (October 30, 2014). "Timberwolves 97, Pistons 91: Sizzling fourth-quarter rally fizzles at Minnesota". Booth Newspapers. Retrieved December 13, 2016. ^ "Wolves rookies Andrew Wiggins and Zach LaVine dub themselves "Bounce Brothers"". Retrieved May 13, 2015. ^ "Flip Saunders Named Timberwolves Head Coach". Minnesota Timberwolves. June 6, 2014. Retrieved December 13, 2016. ^ "Timberwolves to Wear Commemorative Patch in Honor of Flip Saunders" (Press release). Minnesota Timberwolves. October 27, 2015. Retrieved December 13, 2016. ^ "Minnesota Timberwolves Agree to Terms with Tom Thibodeau and Scott Layden". Minnesota Timberwolves. April 20, 2016. Retrieved June 30, 2016. ^ "Timberwolves trade Zach LaVine, Kris Dunn, No. 7 pick to Bulls for Jimmy Butler". ^ "Minnesota Timberwolves Acquire Robert Covington, Dario Šarić, Jerryd Bayless and a Future Second-Round Draft Pick from Philadelphia". NBA.com. November 12, 2018. Retrieved November 13, 2018. ^ "Timberwolves Relieve Tom Thibodeau of his Duties". NBA.com. January 6, 2019. Retrieved January 6, 2019. ^ a b c d e "Logo/Uniform History – HOWL! MNTwolves Basketball". Mnwolves.weebly.com. Retrieved March 22, 2013. ^ "Timberwolves Logo Undergoes Facelift". Timberwolves.com. NBA Media Ventures, LLC. June 25, 2008. Retrieved April 3, 2017. ^ "Wolves Unveil New Uniforms". Minnesota Timberwolves. August 18, 2008. Retrieved June 30, 2016. ^ "Timberwolves Unveil Modified Uniforms". Timberwolves.com. NBA Media Ventures, LLC. August 16, 2010. Retrieved February 12, 2017. ^ "Wolves Unveil New Black Alternate Uniforms". Timberwolves.com (Press release). NBA Media Ventures, LLC. November 23, 2010. Archived from the original on November 26, 2010. Retrieved August 3, 2015. ^ Phillips, Aron (November 24, 2010). "Timberwolves Go "Back in Black" With New Alternate Uniforms". Dime Magazine. Retrieved March 22, 2013. ^ "Timberwolves Unveil 'Lights Out' Alternate Uniform". Timberwolves.com. NBA Media Ventures, LLC. November 27, 2013. Retrieved August 3, 2015. ^ a b c Timberwolves PR (August 10, 2017). "NEW ERA HAS NEW THREADS AS TIMBERWOLVES REVEAL NEW UNIFORM DESIGN". Timberwolves.com. NBA Media Ventures, LLC. Retrieved August 21, 2018. ^ Burton, Josh (August 10, 2017). "Minnesota Timberwolves Unveil New Nike Uniforms for 2017-18 Season". SLAM. Retrieved June 18, 2018. ^ a b Mizutani, Dane (August 10, 2017). "Minnesota Timberwolves introduce new uniforms". St. Paul Pioneer Press. Retrieved June 18, 2018. ^ Ratke, Kyle (September 16, 2017). "NBA, NIKE AND TIMBERWOLVES CERTAINLY MADE A STATEMENT FRIDAY NIGHT". Timberwolves.com. NBA Media Ventures, LLC. Retrieved August 21, 2018. ^ Mizutani, Dane (September 16, 2017). "Break out your sunglasses and check out the Timberwolves' new neon green jerseys". St. Paul Pioneer Press. Retrieved June 18, 2018. ^ Timberwolves PR (December 31, 2017). "TIMBERWOLVES UNVEIL FINAL UNIFORM EDITION". Timberwolves.com. NBA Media Ventures, LLC. Retrieved August 21, 2018. ^ Miller, Chris (December 27, 2017). "Timberwolves unveil gray 'City Edition' uniform". Star Tribune. Retrieved June 18, 2018. ^ PR, Timberwolves. "TIMBERWOLVES UNVEIL CLASSICS EDITION UNIFORMS AND 30TH SEASON LOGO DESIGN". ESPN. Retrieved August 30, 2018. ^ Timberwolves PR (November 1, 2018). "TIMBERWOLVES UNVEIL PRINCE-INSPIRED CITY EDITION UNIFORMS". Timberwolves.com. NBA Media Ventures, LLC. Retrieved February 2, 2019. ^ Timberwolves PR (December 12, 2018). "TIMBERWOLVES UNVEIL NIKE NBA EARNED EDITION UNIFORMS". Timberwolves.com. NBA Media Ventures, LLC. Retrieved February 2, 2019. ^ "Minnesota Timberwolves Mascot Crunch!". Minnesota Timberwolves. July 10, 2015. Retrieved July 10, 2015. ^ "Minnesota Timberwolves give Flip Saunders' name a place among rafters". NBA.com. February 15, 2018. Retrieved February 23, 2018. ^ "Muhammad Embraces Move To Timberwolves". NBA.com. June 27, 2013. Retrieved April 21, 2014. ^ "Minnesota Acquires Draft Rights to Lazar Hayward". NBA.com. June 25, 2010. Retrieved April 21, 2014. ^ a b "Record-tying 84 international players on opening-night rosters". NBA.com. October 31, 2012. Retrieved April 21, 2014. ^ "CBS Minnesota". Minnesota.cbslocal.com. March 4, 2013. Retrieved March 22, 2013. ^ "830 WCCO « CBS Minnesota". Minnesota.cbslocal.com. Retrieved March 22, 2013. ^ "Wolves Name Alan Horton Radio PxP Announcer". Minnesota Timberwolves. October 11, 2007. Retrieved December 13, 2016. ^ "Minnesota Sports News, Video & Photos –". Foxsportsnorth.com. Retrieved March 22, 2013. ^ "My29 WFTC Minneapolis–St. Paul – My29 WFTC Minneapolis–St. Paul". My29tv.com. March 7, 2013. Retrieved March 22, 2013. Wikimedia Commons has media related to Minnesota Timberwolves.